Once upon a sandy strip of Highway 98, Howard Group built 20 stores on a parcel of land between Destin and Santa Rosa Beach. Among those early anchors were Nautica and Brooks Brothers, which still occupy space at Silver Sands Premium Outlets today. Back then, it was a challenge for the real estate developer to find tenants – and traffic. But over the course of seven expansions and two decades, they no longer have trouble with either sales or shoppers. Today, Silver Sands Premium Outlets is home to 110 stores, welcoming 7 million visitors each year. 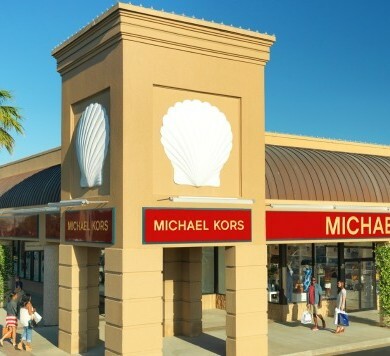 The first destination of its kind in Northwest Florida, it is now one of the largest outlet malls in the nation. While you probably planned your vacation with our pristine white sands in mind, we encourage you to explore Silver Sands, where designer and name brand outlets offer savings of 25 to 65 percent every day – not to mention BIG seasonal sales and events. Some of those options include Carrabba’s Italian Grill, Cheeseburger in Paradise, Panera Bread, Harry & David and Rocky Mountain Chocolate Factory. Once you’re fueled up, the more serious shopper can save even more by signing up for the free VIP Shopper Club here, Johnson shares. Perks include access to exclusive online coupons, a voucher for a free coupon book, insider news, shopping tips and more. For a full list of retailers and center hours, please visit Silver Sands Premium Outlets online or call (850) 654-9771. You can also keep up with the latest deals and sales by following @premiumoutlets on Twitter and Instagram.